How to recover forgotten software keys in windows? 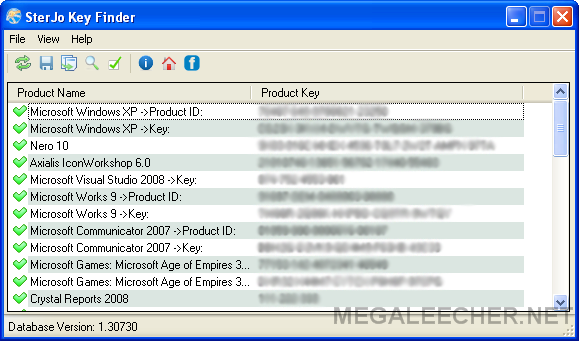 You will find the SterJo Software key finder a very useful tool. It has several advantages over more prominent and branded key finders while at the same time getting the job done just as good, if not better. First of all it doesn't take much space, practically no space at all so it doesn't affect the normal functioning of your PC. Second, it is completely free unlike other tools that you need to purchase/pay fees for, all you do is just download it directly and install it with a very simple process - just by clicking the "download" button, extracting the item in a certain folder and running it. Quite simple and easy. And at last, you'll find it is more effective than most of the other key finders you've used so far. It works for product keys for multiple programs and games, such as Nero, Corel Draw, Windows, WinZip, Office, Cyber Link Power DVD, AutoCAD, Age of Empires, FIFA, Halo, Need for Speed an so on... the list is huge. Another great feature of this tool is the fact that once it recovers a lost product key, it actually saves it in a text file so that you're able to use it in future too, thus preventing you from losing it a second time. And once you have downloaded and installed it, you don't have to do anything else, it starts working automatically, it takes over and you can sit back and relax. Although the recovering lost product keys process is very simplified, another great feature of this tool is the ability to recover keys from unbootable drives. Many times it happens a hard disk failure and we are not able to boot into our Windows system. Fearing that you've lost all your installed software licenses for good, the only option would be to replace your old hard drive and purchase the license for each software individually. Well, this is not a case with SterJoKey Finder. All you will need to do is attach your hard drive to a working Windows system as external drive and run this tool. The recovering process from a failed drive is as quickly and fast as a normal working drive. Once the unbootable drive is detected by your Windows OS, all you have to do is click "File" menu and select "Recover Keys from External Windows Directory". It will be opened a new window asking to choose your Windows location from the malfunctioned drive. The process is exactly the same as for dual boot Windows also. After the folder selection, all you need to do is click the "OK" button and wait for a few seconds. SterJo Key Finder would try with all its efforts to recover any product key it could find inside that defected drive. People working with computers will especially appreciate this simple tool. A really efficient and free solution to your problems with lost product keys. does it really work. will it work on driver update. will someone be knocking on my door if i use it. thanks people Manny.